As UNESCO (The United Nations Educational, Scientific and Cultural Organization) has taken over the patronage of observances marking Tadeusz Kościuszko’s death bicentenary, the Polish American Congress Michigan Division (PAC-MI) is also joining to celebrate the life and achievements of this great Polish and American hero. Throughout the year, our Division will hold a few events commemorating this great man, but it will mainly be a way of reminding our members (and general public) about the fact that in downtown Detroit (on the crossroads of Third Street and Michigan Avenue) stands a glorious monument of Kościuszko. This cast statue is the work of the Warsaw-born Italian-Polish sculptor, Leonard Marconi. It was cast in 1889 for the grounds of the Wawel Castle in Kraków. To honor Detroit on the bicentennial of the United States, the city of Kraków had the statue donated to the city. The idea of marking Kościuszko’s death bicentenary has met with great enthusiasm from Detroit’s City Council. A special presentation of Testimonial Resolution is planned for the month of February at one of City Council’s Formal Sessions. Margaretta Venson, the Legislative Assistant at the Office of Detroit City Council President Brenda Jones, shares that the Testimonial Resolution, which will feature Kościuszko’s biography, will become a permanent record in the Council’s archives. Our Division has also designed and produced (with the Polish Mission of the Orchard Lake Schools as co-sponsor) a special pamphlet to distribute at various Polonian events. The illustrated pamphlet features a short biography of Kościuszko and information about his Detroit monument. It will be available for anyone at the upcoming Polish Folk Festival at the American Polish Cultural Center (Saturday, February 11). Come see us at our special booth to receive the pamphlet and other promotional material about our activities. 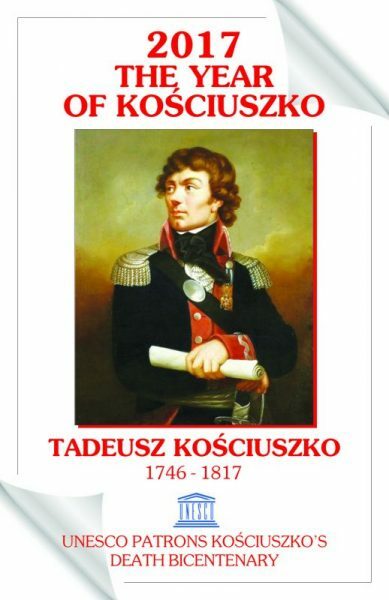 Tadeusz Kościuszko (1746-1817) was a Polish military engineer and a military leader who became a national hero in Poland, Lithuania, Belarus, and the United States. He fought in the Polish–Lithuanian Commonwealth’s struggles against Russia and Prussia, and on the American side in the American Revolutionary War. As Supreme Commander of the Polish National Armed Forces, he led the 1794 Kościuszko Uprising. Tadeusz Kościuszko came to America from Poland in 1776. He was a skilled engineer who came to offer his services to the American colonies in their struggle for independence. On October 18, 1776 Kościuszko was commissioned as Colonel of Engineers by the Continental Congress and began his outstanding service of fortifying battle sites, many of which became turning points in America’s fight for independence against the British. In 1778, Kościuszko was made chief engineer of West Point, New York. This fortification became known as the American Gibraltar because it was unable to be penetrated by the British Army. Eventually West Point became a military academy. In 1783, Kościuszko was appointed Brigadier General and was awarded the Cincinnati Order Medal by General George Washington, Commander-in-Chief of the Continental Army. Washington also presented Kościuszko with two pistols and a sword as gifts for his outstanding service to America. After the colonies won their independence, Kościuszko returned to Poland in 1784 to help his own country win independence from the surrounding European powers. Kościuszko was the national hero of the 1794 insurrection. After the successful battle of Racławice on April 4, 1794, first Warsaw and then Wilno were liberated from enemy occupation. Kościuszko was wounded in the failed revolt and taken prisoner by the Russians. The insurrection’s collapse was followed by the 3rd partition of Poland in 1795 by Russia, Prussia and Austria. Poland regained independence in 1918. Kosciuszko spent the last years of his life in Switzerland, where on October 15, 1817 he died at the age of 72. He is buried in Wawel Castle, in Kraków, Poland, among the tombs of the Polish Kings. One of Kościuszko’s most significant and poignant achievements was his pursuit into freeing African-American slaves. He made several wills, notably one in 1798 stipulating that the proceeds of his American estate be spent on freeing and educating African-American slaves, including those of his friend Thomas Jefferson, whom he named as the will’s executor. It is worth highlighting that a motion for UNESCO patronage over the bicentenary was submitted jointly by the Kościuszko Mound Committee in Kraków (southern Poland), the Kosciuszko Foundation in New York, and Kosciuszko Heritage Inc. in Sydney. This article has also been submitted to the national PAC Newsletter “Your Voice in America”.